It's no secret that C# 7 is one of the biggest updates to Microsoft's homegrown programming language that the .NET community has ever seen. So far, previews of the 7th iteration of updates to the C# language specification and its associated APIs have let us play with exciting new features like local functions and the inline declaration of out variables. These new features, while extremely useful, are relatively self-explanatory since they simply build or improve upon old features of the language. Among these improvements, however, is a new feature that isn't so obvious: the tuple value type. If you've worked with languages like Python before (or if you've worked extensively with relational data in C#), you may already be familiar with the concept of tuples. (Since tuples have always been available via an API in C# before the new version, you might have seen them before!) Even though C# 7 doesn't modify the definition of a tuple, it (fortunately) makes implementing them much easier and much more useful. Since not everyone is familiar with what a tuple actually _is_, this post is first going to briefly walk through the background of tuples. (I promise this won't be a history lesson, but you will be able to get an idea of how tuples might be useful in the scope of your application.) 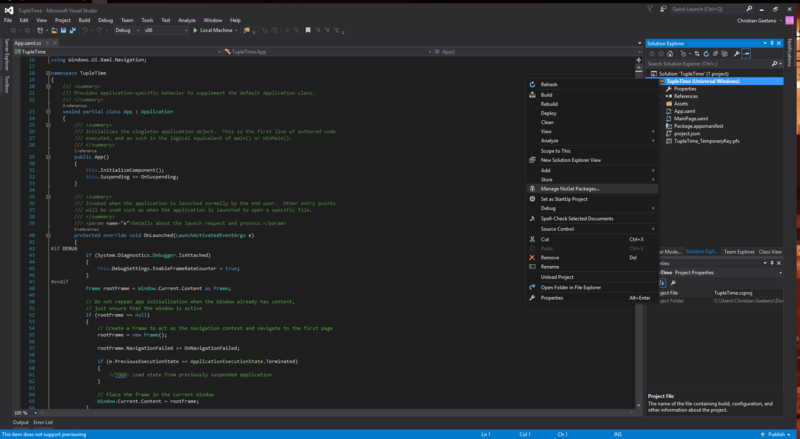 Then, I'll go through a quick example to show you how you can get the new tuple features offered by C# 7 up and running in your project right now as well as the best way to incorporate them into a new or existing app. What Exactly Are Tuples, Anyway? The examples above illustrate what tuples are: objects that support the storage of different data types (although it's not required!) and different amounts of data. While the tuple literal syntax makes declaring these objects much easier, creating these objects was always possible using the .NET Framework's System.Tuple API.aspx). So what's the big deal? Read on to find out how the addition of tuples to value types in C# 7 makes them more powerful than ever! Performance. Now, you don't need to store a tuple as an instantiated class to use it in your code. For example, if you want to return a tuple from a function, you can just return one via a tuple literal. Then, it's up to caller to either use the tuple immediately or store it. This gives you more control over memory consumption and garbage collection (GC) in your application. Basically, tuple value types eliminate the memory overhead of the old tuple API. Software design. Just like with the int or string value types, you can now indicate that your function will return a tuple value. Why is this any different than using the old System.Tuple API? Semantics. You can now easily specify the types and names of data values that your function will return in a tuple. Take a look at the examples below to see this in action. // Hmmm...how do we access the 2nd population value? // Perhaps we could do something like population.secondPop? Okay, so that's not such a big deal. We declared our own tuple, so we know where the item we want is located. But what if that tuple were returned from a function in one of our references? Clearly, things become much more complicated as we begin working with tuples returned from functions we didn't write ourselves. Along with the memory allocation concerns, this is the major problem that has kept the C# community from adopting tuples on a larger scale. But now, with the dawn of C# 7, that's all changed! Behold, custom semantic naming of tuple items! // Hey, there's a new property! It's called city! Woo! And there you have it, the new power of tuple value types in C# 7! The above code snippet clearly illustrates the performance and usability benefits of including tuples in the exclusive "C# value type club." 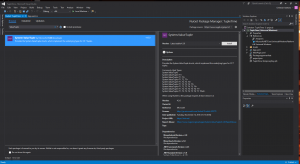 You'll have to be using the latest update of Visual Studio 2015 or the Visual Studio 2017 RC to take advantage of the tuple value type, so make sure you're on the cutting edge before moving on! 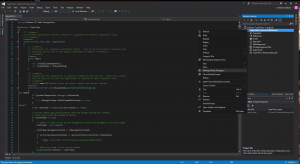 Open up your C# project in Visual Studio. 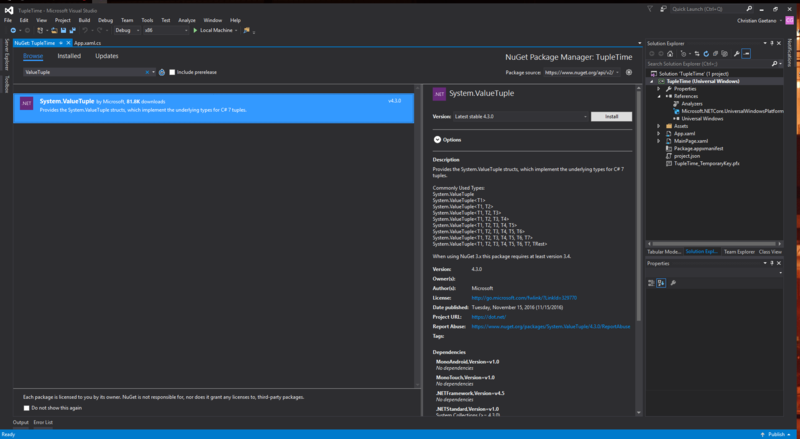 Right click on your project in the Solution Explorer and click "Manage NuGet Packages..." Right click on your project and then click "Manage NuGet Packages..." to find the Tuple value type extensions. Click 'Browse' in the upper left hand corner of the NuGet Package Explorer then search for 'ValueTuple.' Click the Install button and click through any prompts. Search for ValueTuple and install the System.ValueTuple package to your project to activate the new features. Begin using tuple value types in your project! That wasn't so bad, was it? Eventually, the tuple value type will be included in the C# language by default, and you won't need to take the above steps to use it. For now, though, at least the NuGet install procedure is pretty straightforward! Data access: tuples are commonly used to store data records (rows) loaded from a database. This is a particularly useful case because tuples can store a row of data no matter how many fields it has or what data types those fields store. 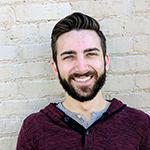 This use case works with both the System.Tuple API and the value type, although the value type allows some more functionality with semantic naming. Returning multiple values from a function: as seen in our examples above, this is really the most useful case for the new tuple literal syntax and tuple value types. The new features of tuples allow you to return immutable lists of strongly typed values from your functions. Most importantly, you can provide semantic naming for each of these returned values, making your API easier to use and your code more readable. Go forth and use tuples! The tuple value type isn't the most innovative feature to be added to the C# language, but it is certainly one of the most useful. Not only can the new tuple value type increase your applications performance, it can also bring your code to a new level of simplicity and readability. If you want to learn more about the new tuple value type, check out the official Microsoft blog post about new features in C# 7. If you have some questions about this blog in particular or you just want to "talk shop," simply comment below or send me an email! Thanks for reading, and have a great, tuple-filled 2017!